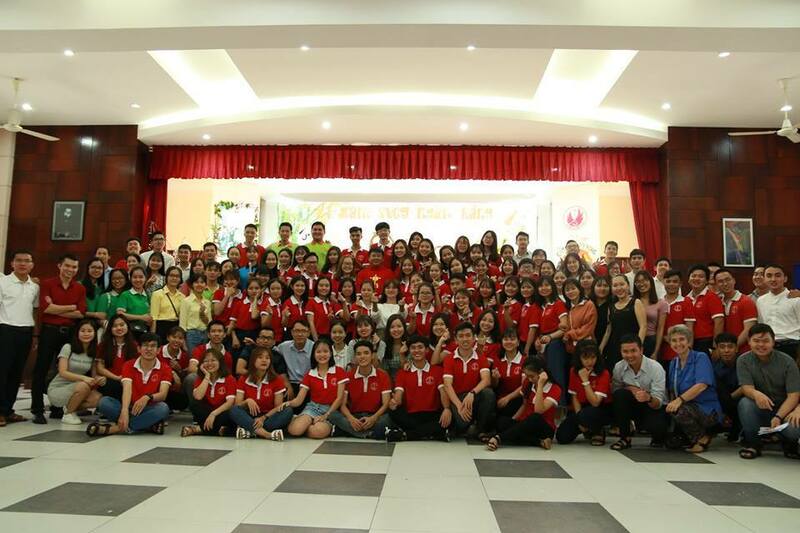 The 25thof November is one of the most important days of the Catholic Student Group of Banking University. It is our twenty-first birthday celebration. The great day is also our Feast day, the 30th anniversary of the canonization of the Vietnamese Martyrs – our Ancestors and our Patron Saints. Besides, it is the last Sunday, the Feast of Jesus Christ the King. Therefore, the mass becomes more meaningful with 3 intentions: the birthday, the Feast of the Vietnamese Martyrs and of Jesus Christ the King. 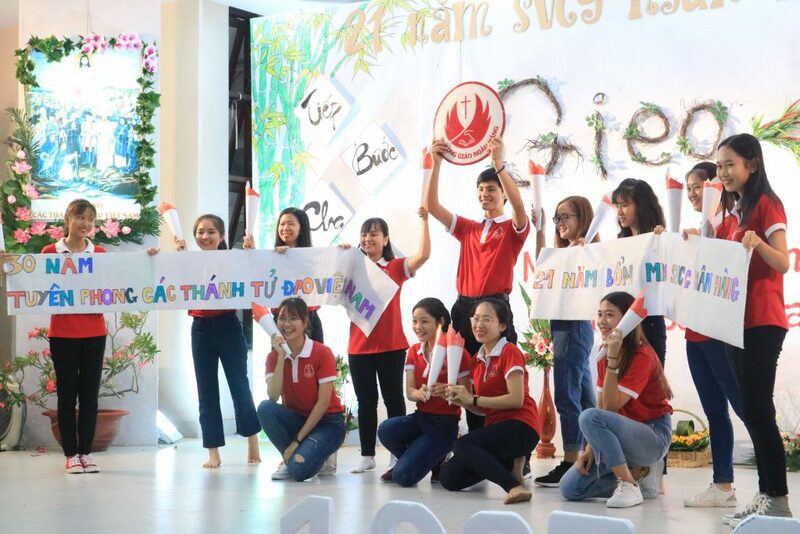 To hold a special celebration, the group leader and all members have to be up idea and prepare it few weeks ago with the support of two Jesuit Scholastics. All members themselves draw the background and some pictures to describe the memories and special activities that they had performed together during the formation of the group. 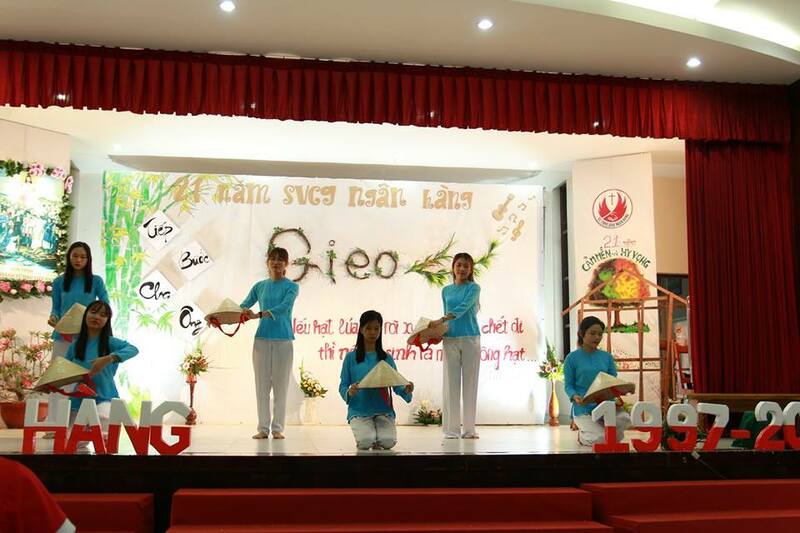 They also rehearsed for a play to recall the persecution of a martyr, whose name is Peter Nguyen Khac Tu. Some girls practiced singing and dancing to perform. The process of preparation was quite hard but every member felt very happy and eager to join in because they worked together to create a memorable anniversary. The anniversary occured in a rainy day when the typhoon No.9 attacked Ho Chi Minh City but it could not prevent people coming to the anniversary. The people attending in the celebration were not only members of group but also the old supporters, former members and those of other groups, about more than 100. At the Mass, Fr. Peter Trương Văn Phúc. S.J., preached on the subject of sowing, like the martyrs who sacrificed themselves to prove their faith and the trust in Lord. Near the end of the Mass, it was the admission of new members of the group showing the members’ cohesion and respect for each other. The group is always willing to invite everyone to share faith and desire to serve people. After the Mass, everyone gathered together for lunch, then they shared the emotions, the former members told the memories deeply when they had joined the group, the new members shared the reason for coming to the group and the initial confusion and they pray together for the development and spread of the group. Thank be to God because we are fulfilling our motto: “Connect people to the love of God!” May the Lord and the Saints bestow favours and accompany us on all paths so that we can bring the bright red of our T-shirts to every place, to those who have not known God and His love and the glow of youth to everyone.